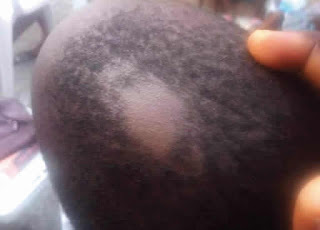 Mrs Roli Abayomi-Samuel, the mother of a seven-year-old primary two pupil of Pedrisi School, Ogoyo, Lekki, Lagos State, has asked the school authorities to return the shaved hair of her son. The mother made the request following the receipt of a letter from the school, terminating the membership of the pupil and his three other siblings. The school also refunded their fees. Saturday PUNCH learnt that the school and the woman were at loggerheads over the circumstances surrounding the shaving of a part of her son’s head in the school. Abayomi-Samuel told our correspondent that she made the discovery when he returned from the school with his siblings on Friday, January 18, 2019. She stated that upon enquiry, her son told her that he woke up to the shaved head while he was in the classroom. The mother of four explained that the boy explained that it was his classmate who drew his attention to the shaved part. She said, “My husband dropped the four of them off at the school that day. I was supposed to go and collect them, but I was very tired to drive. I begged that the school bus should bring them home. Immediately my son came in, I saw the shaved head. I was shocked. “I quickly drove to the school and met with a teacher. The teacher said he saw the boy in the morning but his head was not like that then. The teacher said the incident probably happened on the playground. My son mentioned the name of one of his classmates. He said he was sleeping in the class when the classmate woke him up and mocked him over the shaved part. Abayomi-Samuel, a caterer, said she did not let her children go to school the following Monday and Tuesday, adding she was surprised that the proprietress, who is also the principal, did not bother to call her to know why the children were absent. The mother said the police eventually maintained that the head was shaved by the pupil on the playground, adding that she suspected the investigation was influenced. She said the family allowed the children to return to the school on Monday, January 28 while hoping to get to the root of the matter. She stated, “My husband took my children to school on Monday. When I went to pick them up in the afternoon, the principal gave me a letter and a cheque, refunding their fees. Since the incident occurred, she has not called to apologise. I need my son’s hair. “I didn’t have the intention of withdrawing my children. Even when the matter was being investigated, I went to buy new uniforms for them because their uniforms are old. I am a mother; if I see something that annoys me, won’t I talk? The school claimed they learnt I wanted to withdraw my children; did I inform them? Now that they have returned the school fees, I also want my son’s hair. I don’t believe it was a child that shaved his head,” she added. However, the school principal and proprietress, Isi Adigwe, said the management’s investigation revealed that the boy’s head was shaved by a pupil on the playground after the closing time. She said, “On Saturday (a day after the incident), I called for a meeting with the staff members. From my investigation, I discovered that the incident must have occurred when the children were waiting for their parents to come and pick them up. The school closes at 2.30pm. “I discovered that it must have happened on the playground when the boy was among his peers. A nanny was supposed to take care of them, but she was not with them. I gave the nanny a query and on Sunday, I went to the mother’s house. I told her that a child must have done it, but she did not listen to my explanation. She insisted it was an adult that did it. The principal explained that they returned to the station the following day (Wednesday, January 23). She said while the matter was under investigation, the victim’s mother came to the school to demand the withdrawal of her four children. On Thursday, January 24, the DCO (Divisional Crime Officer) came to the school and interrogated everybody that came in contact with that child. She asked us to call the pupils out randomly and they all testified that it was the boy, whose name the affected pupil mentioned, that shaved the head. Adigwe said afterwards, the four children did not return to school, adding that the management learnt from parents of other pupils that Abayomi-Samuel did not want her children to attend the school again. She said she decided to write to the victim’s father to grant the withdrawal because she felt the woman no longer had confidence in the school despite the outcome of the investigation.